I love a good winter soup. Last summer, my garden gave abundant storage squash and a boatload of carrots, which we harvested just before December's first major deep freeze. These are so candy-sweet I've been digging (get it?) eating them raw, but they're also fabulous roasted or — in this case — in soups or stews. 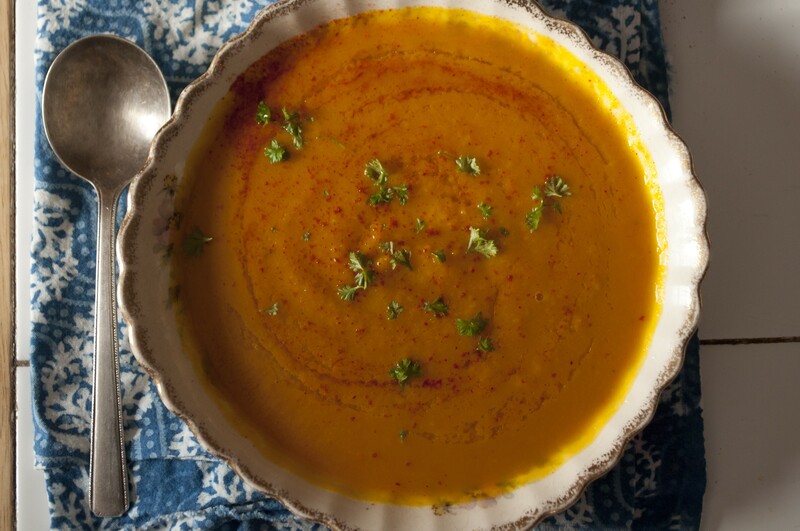 Last weekend, I threw together this easy little blender soup, which is basically just squash and carrots and coconut milk — heart-healthy and vegan in a season during which I tend to lean on cheeses, meats and potatoes for calories. Pro tip: Double the recipe and freeze or can (20 minutes in a pressure canner at 15 pounds renders this shelf-stable). With a buttered roll, it's insta-lunch, any day of the week! The only catch? You kind of need a food processor. Cutting up all those veggies is time consuming without one. Meanwhile, warm the oils in a large saucepan over medium-low heat. Add the vegetables and water/stock. Cover and cook, stirring occasionally, until the veggies are soft, 20-25 minutes. Add coconut milk and stir thoroughly. Cut heat and churn in a blender (regular or immersion) or food processor until smooth. Garnish with smoked paprika and drizzled sesame oil, and serve with crusty sourdough bread.